When we were young we didn't have much. The age old story of young kids who make something out of nothing. I'll never forget that fateful visit to the Goodwill in Gilroy with the homie Lydon. I don't remember what we were looking for but once we found it, we found ourselves. The Quick Shot Studio 4 was a toy made for children to produce their own audio bits. Be it radio show, remix or otherwise, the Studio 4 unit enabled you to mix an 1/8" input, with a mic, and a handful of onboard sound effects you could dub down to it's onboard tape deck. If my memory serves me, it had a $4 price tag on it but that day happened to be half off of electronics day. 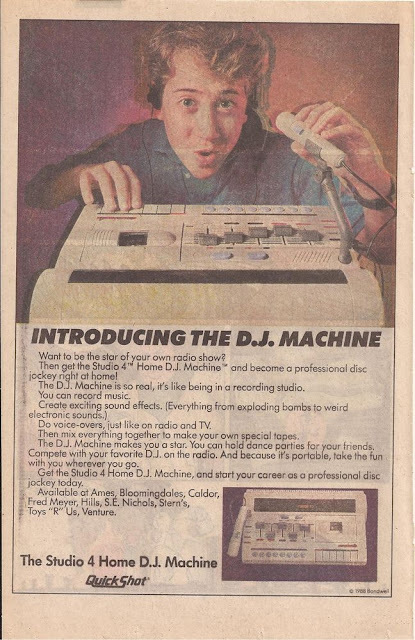 We went halfers on a $2 piece of gear that would go on to be a cornerstone of our creativity for years to come. Over time we would end up with a bunch of proper music gear but our Quick Shot Studio 4 would still get plenty of play. I still have cassette tapes that were recorded on that thing and it now serves as the backdrop for this website. Someday they'll make their way into the universe, till then I'm going to cop a second one to keep in my office at work.